« Spring Will Be a Little Late This Year…..
April (next month) is National Nutrition Month, but this tidbit couldn’t wait. Just saw a part of Deepak Chopra and his colleage on TV and this is what I caught on their talk about Brain, Body & Mind Connections. H is for Handling Stress with several methods such as meditation, laughing, etc. I is for Interaction with others, whether it be friends, family, or colleagues. And let’s not forget pets! E is for Exercise, and as Deepak pointed out, no need to overdo, just moderate exercise will be beneficial. L is for Laughter, which we all know is good for us to relieve stress, to let off steam, to promote good feelings, etc. 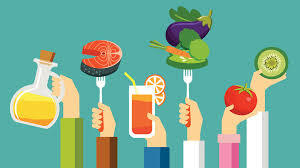 D is for Diet, with an emphasis on whole foods (not factory foods). This is my new answer for: “How do you spell HEALTH?” I spell it: S.H.I.E.L.D. This entry was posted on Saturday, March 24th, 2018 at 8:03 am	and is filed under Health Matters: Flashes & Reports, Home Page. You can follow any responses to this entry through the RSS 2.0 feed. You can skip to the end and leave a response. Pinging is currently not allowed.